Willa Bean's Cloud Dreams by Cecilia Galante. Book 1 in the Little Wings Series. Review: Passion, depression, and joy are three words that describe Willa Bean Cloud Dreams, which is written by Cecilia Galante. This book contains passion because Willa Beans yearns to fly. She wants to achieve this because her best friend Harper is able to fly already. She keeps attempting to fly but she can't. Depression is expressed in this book because she always tries to fly, but she fails. She cries and cries and questions her family for advice, but none comes. She locates many other cupids flying but not her. Joy is is in this book because the person who discovers the solution is WILLA BEAN herself. She is glad to be able to fly because she attends flying classes in her Cupid Academy. To begin with, they are not humans, but they are Cupids. Willa Bean is frustrated that she cannot fly and her first day of school is tomorrow, and she cannot fly! So, to attempt to fly before her school starts, she asks her best friend, Harper, to teach her to fly. However, none of her advice works. So, Willa Bean has to go through a whole day of school without being able to fly. At flying class everyone in her class is able to fly, but her classmate, Raymond, wasn't able to fly because he possesses heavy metal pins on his shirt. So, he had to take them off to fly. On the bus ride home Willa Bean figures out why she couldn't fly. What I think about Willa Bean Cloud Dreams is that it is a very odd book for readers in fourth grade and up. The commendable sections that this book possesses are considered very addicting because the book is just adorable to younger children. I don't recommend this book for children above the fourth grade. This book is a well-written story and would not be understood by elder kids. Review written by Dalton (6th grade student). 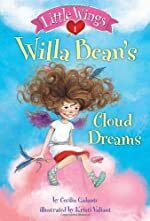 We would like to thank Random House for providing a copy of Willa Bean's Cloud Dreams for this review. Have you read Willa Bean's Cloud Dreams? How would you rate it?